Great ideas of gifts you can make from your very own kitchen. Give a gift that has the secret ingredient of love stirred right in! Get plenty of homemade gift inspiration in one place. It's time to make your list and check it twice, the big day will be here before we know it! Making gifts in your kitchen is a great way to show you care and give recipients something with that extra secret ingredient, love! This is a one stop shop for all of the best gift ideas from your kitchen! I don't know about you, but I am feeling a little bit behind in the Christmas prep department. I have been busy in the kitchen getting plenty of posts ready to share with you, but as far as gift purchasing and making goes, I am woefully ill-prepared. So I am looking forward to getting some great ideas here. I have lots of neighbors, teachers, friends and family I would like to show a little extra appreciation for and what better way than with a gift from the kitchen? I am starting a board on Pinterest just for fun gift ideas. I can always use the added inspiration, so I figured you might need the help as well! Bloggers, don't be shy. 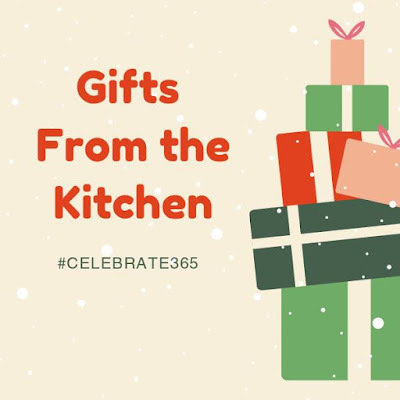 Link up your best gifts from the kitchen ideas. Everyone else, get ready to be inspired! If you have a favorite you like to make and give, I'd love to hear about it in the comments! I need to go check out your Pinterest board and see what all you are finding!